The elves at emailSanta.com know all about Trackers! asked Santa for a little help! Santa's elves are helping out the Easter Bunny! There are many ways the elves track Santa Claus here at emailSanta.com! The elves have a special webcam in Santa's office called The Santa Webcam. The elves made a webpage that shows where Santa is right now. It's called the The Santa Tracker. And on Christmas Eve, you can track Santa Claus and watch him deliver presents from his sleigh! It's called the Christmas Eve The Santa Snooper. Here's just some of what the elves have done for the Easter Bunny at Easter-Bunny.net! The elves made a special map that shows where the Easter Bunny is right now! The elves joke that "EGGS" marks the spot on the map, but really, it's the Easter Bunny's ears that mark the spot! How long till the Easter Bunny? The elves love getting their chocolate eggs from the Easter Bunny! (They like to dunk them into their hot cocoa.) That's why they made the Countdown to the Easter Bunny! You know how good the elves are at snooping on Santa Claus Christmas Eve! They hopped at the chance to help the Easter Bunny with the Easter Bunny Tracker! Now you can track every stop and hop of the Easter Bunny and his Easter basket! The Easter Bunny is very good at his job. But everyone can always use a little help when they're delivering goodies around the world in one night! That's why you can now watch Easter Control Tweets! 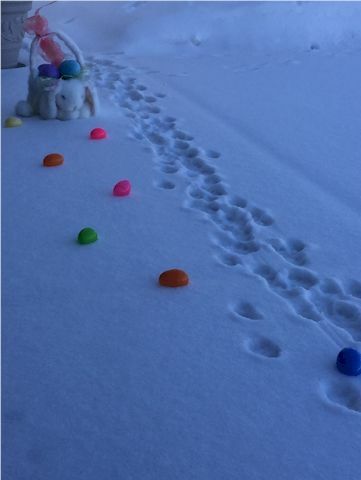 Tweet about Santa tracks the Easter Bunny! Get a reminder to come back to emailSanta.com closer to Christmas! Instead of tracking the Easter Bunny, you can come on Christmas Eve Day to watch Santa & his reindeer LIVE on the Santa Snooper!